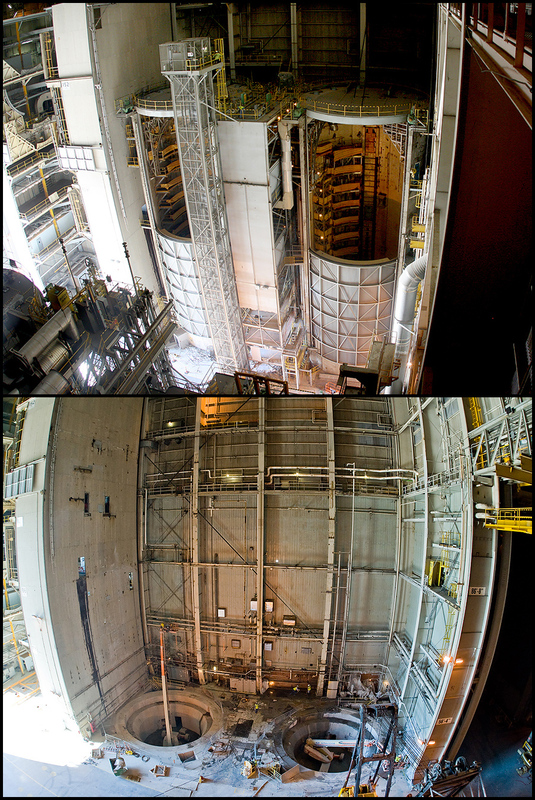 Michoud Assembly Facility modifications continue to make progress in support of requirements for NASA’s Space Launch System, or SLS. Multiple projects are scheduled through 2014. Major facility modification and construction projects are scheduled in Buildings 103, 110, 114, 115, 131 and 451. In Building 103, Michoud’s main manufacturing building encompassing 42 acres under it’s roof, work to modify the Robotic Weld Tool 3 is steadily progressing. Scheduled for completion by May, the tool will be used to make dome components for SLS, and will be known as the Enhanced Robotic Weld Tool. Meanwhile at a location right off of the main aisle in the center of the building, substantial progress has been made on the segmented ring tool installation. Over the course of a week, what started out as an empty floor has grown into a circle of steel monuments and control boxes dedicated to fabricating L and Y rings for the SLS rocket. These rings are used to make barrel-to-barrel and dome-to-barrel connections within the SLS rocket’s structure. The tooling installation work should be wrapped up in March with test and checkout procedures to follow immediately. In Building 115, a high-bay manufacturing building originally intended for use on the Constellation Program, weld tooling is being installed for making the barrel components for SLS. Known as the Vertical Weld Center, the friction-stir-weld tool will stand about three stories tall once fully assembled. The work is scheduled for completion in June. In Building 110, the demolition work on Cells B and C has wrapped up with an excellent safety record. During the Shuttle program, these cells were used to apply large sections of foam insulation to the external tank. With the last section of concrete removed on Jan. 21, site preparations are being made for the installation of the Vertical Assembly Center. The VAC is where dome assemblies, and the tank barrel sections will be joined together to complete the tanks or dry structure assemblies. The tool also will perform nondestructive evaluation on the completed welds. Once installed, this tool will be the largest of it’s kind in the world. The work is scheduled for completion in March 2014. Building 131 will undergo major modifications. Originally, this building was used for the cleaning and primer application for the Shuttle’s external tank. The building will now be used for the application of the thermal protection system to the SLS rocket. Scheduled to begin in February, the roofline will be extended north to accommodate the SLS’s large size. This requires breaking up the tarmac in front of the building and adding to the existing foundation. Building 451 will receive a modification similar to building 131, with the roofline and foundation being extended to cover the liquid hydrogen tank. The building will continue to be used for proof-testing SLS components. The “beer can,” a barrel-shaped structure for holding the external tank in place during testing, already has been removed from the test tool in preparation for SLS modifications.